This Lotus Notes to MBOX Conversion software can import Lotus Notes NSF to Thunderbird, Apple mail, Netscape, Eudora, Entourage, SeaMonkey, Opera mail, The Bat email clients in batch. The tool works with IBM Notes 9.0 and all below versions in Windows OS. The utility can import .nsf file to .mbox format in different email clients namely Mozilla Thunderbird, Apple mail, Netscape, Eudora, Entourage, SeaMonkey, Opera mail, The Bat etc. which stores email messages and attachments in MBOX file format. 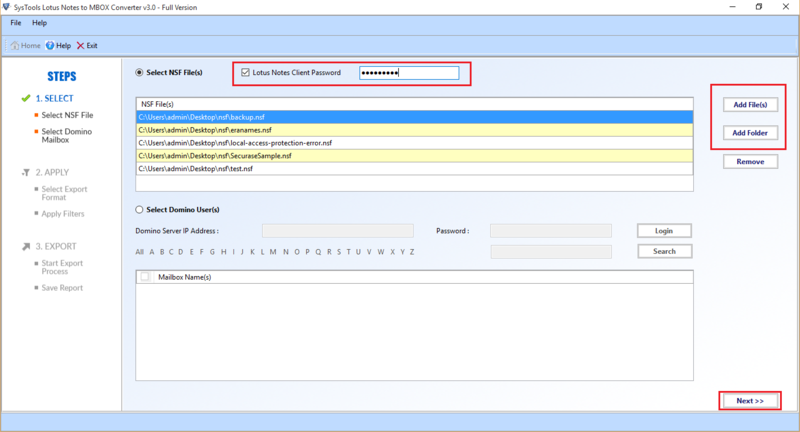 The tool permits users to import numerous emails from NSF file to MBOX file in bulk. Users can add the folder, which has various NSF files in the software and then convert Lotus Notes mails to Thunderbird .mbox format. Lotus Notes mail to MBOX Converter allows users to store the desired files at any location. Users can also create a new folder to save the converted files if they want. Click on the option of Make a new folder for this. The NSF to Thunderbird Converter utility provides inbuilt login facility to convert Lotus Notes Domino Server mailbox to MBOX files by giving Domino Server IP Address and Password. 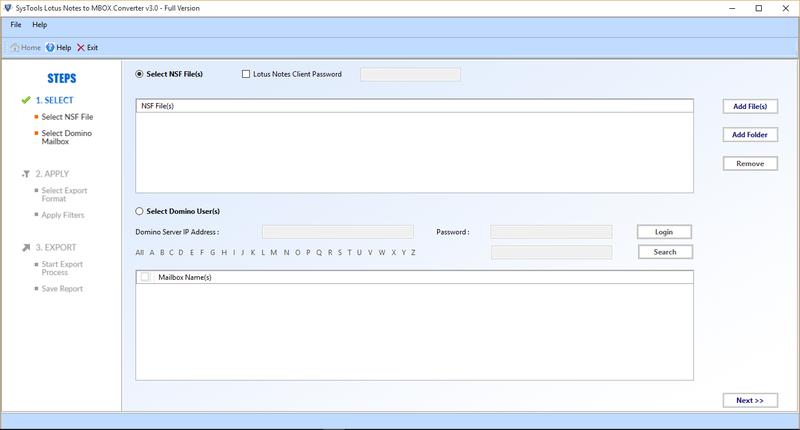 This will allow the users to import Domino mailbox into MBOX format. Once the users choose all the filter options, the NSF to MBOX Converter tool starts the process of migration. It provides the progress details, which includes name of current folder, count of emails, number of folder being converted, etc. and related information. This tool is compatible with Lotus Notes version 9.0 and below editions. Apart from that this tools also supports all the version of Windows from Windows 98 to Windows 10. This utility can also support other application to convert Lotus Notes to Mac Mail, Eudora, Entourage, Netscape, SeaMonkey etc. HTML Formatting: Property to maintain HTML Formatting of the emails. All Documents: Allows all the document view mail items to be transferred. 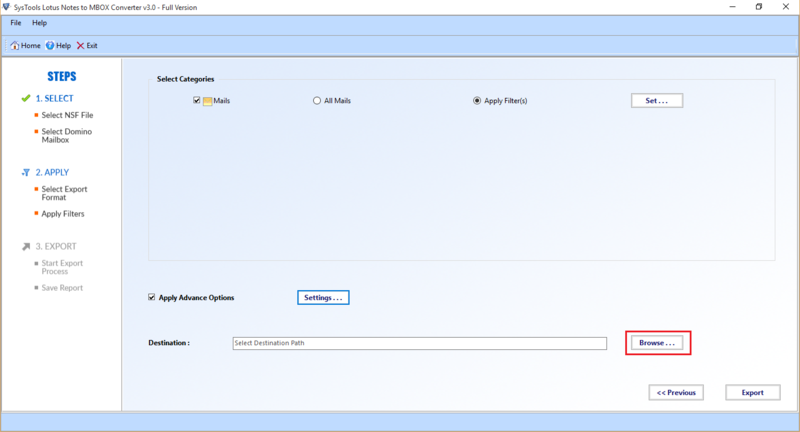 Docklink: Lotus Notes to MBOX migrator maintains Docklink of all emails. 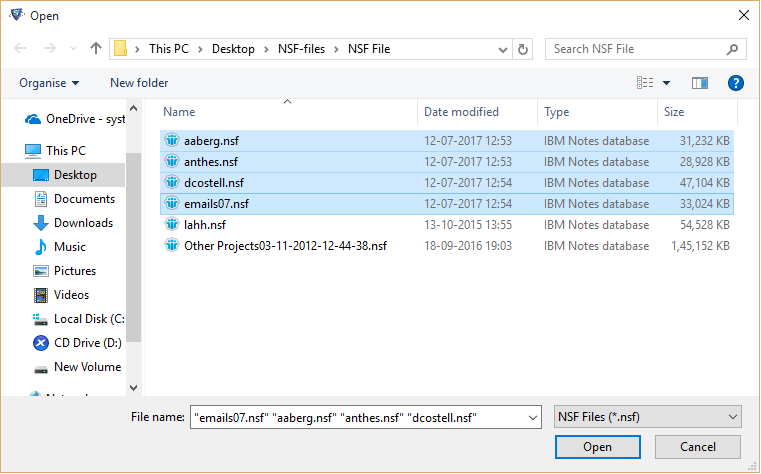 This NSF to MBOX tool transfers all the data files from the source email client i.e. Lotus Notes email to MBOX file format. The software maintains the structure of the folder. This is an optional feature so users can choose 'Yes' if they want to maintain the folder hierarchy or 'No' if they do not want the same structure. Due to the security concerns, the messages in Lotus notes can be in encrypted format. Is the emails are encrypted, then the migration of these files won’t work well. This Lotus Notes to Apple Mail migration tool provides the option to remove encryption from the emails during the NSF files to MBOX conversion. 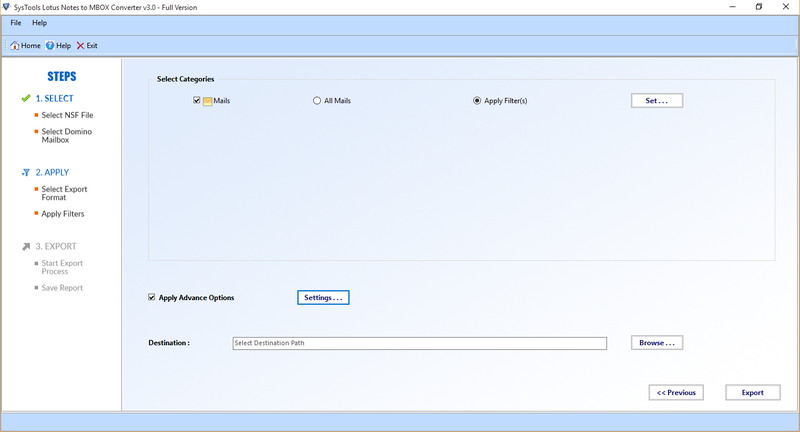 This product allows the users to migrate NSF files to MBOX format and then it allows the users to migrate MBOX files into .mbox supporting email clients. That is, it allows users to import NSF to Apple Mail, Entourage, Eudora, Opera Mail, Thunderbird, Netscape etc. This NSF to .mbox Conversion utility allows the users to migrate Lotus Notes NSF data files in MBOX format into Mac Mail. By using this application, the users can easily convert Lotus Notes to MBOX files and view that MBOX file in Apple Mail account. 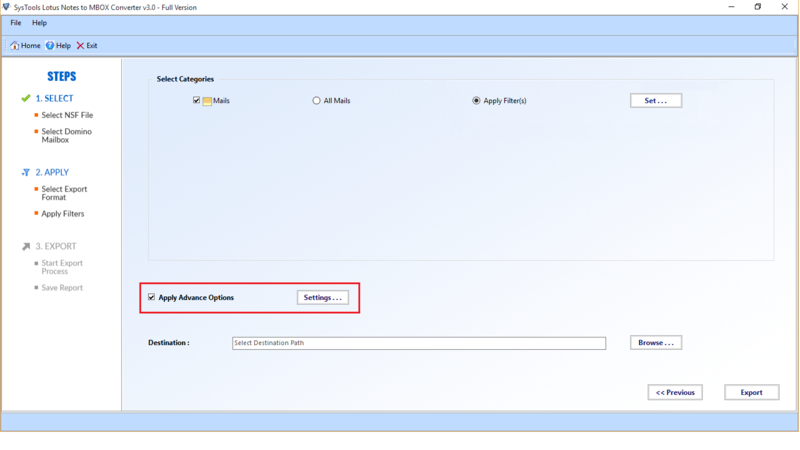 How to Export Lotus Notes NSF to MBOX? Step 1 : First, go to Start menu >> Programs >> Lotus Notes NSF to Thunderbird Converter. Now on the displayed screen, click on OK. Step 2 : Now, to start the process of conversion click on the Select NSF Files >> Add Files. Step 3 : Now browse the specific files to be added, and Open those files. Step 4 : Then, provide the credentials of NSF files that imported from Lotus Notes to MBOX format and click on Next button. Step 5 : Now click on Apply Filters >> Set, and set the required dates to filter the emails accordingly. 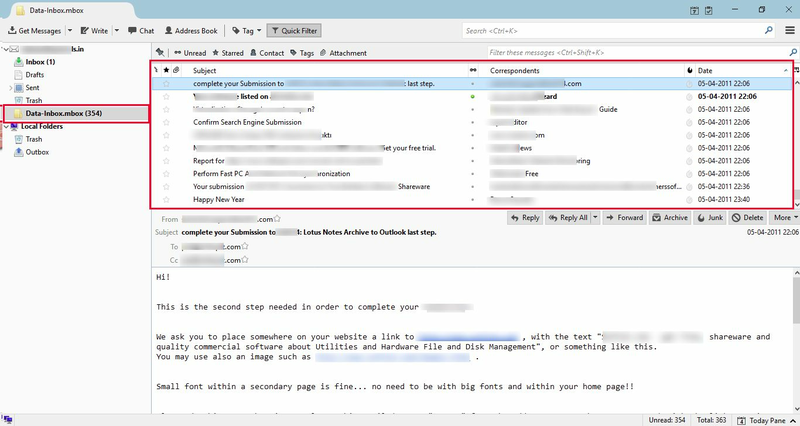 Step 6 : Go for Advance options for more features like HTML formatting, Removal of encryption, All documents, Doclinks, Maintain folder hierarchy, Email Address translation, Mapping etc. in NSF to MBOX Converter software. Step 7 : Choose a destination folder path by browsing the location where you need to place MBOX files and then click on OK. Step 8 : Then, click on the Export option to begin the process. Step 10 : Now save the report of the entire migration process of Lotus Notes NSF to Thunderbird MBOX files. Step 11 : View the Export Report. Step 12 : Now view the NSF files in Thunderbird MBOX file format. Q. Does NSF to MBOX Converter software convert NSF files without Lotus Notes installation? Ans: No, it is mandatory to install Lotus Notes in the system to access this application. 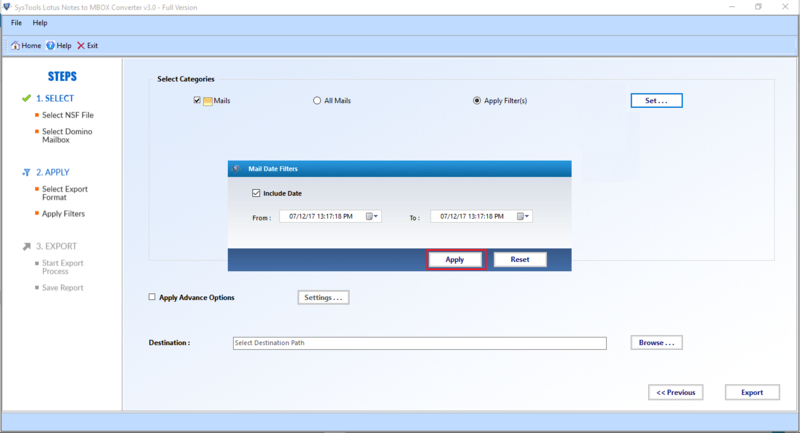 This application requires IBM Lotus Notes account to be installed on the user’s system to convert NSF file to MBOX format. Q. Does Lotus Notes to MBOX Converter modify the source data in any manner? Ans: No, this software does not modify the data a bit. 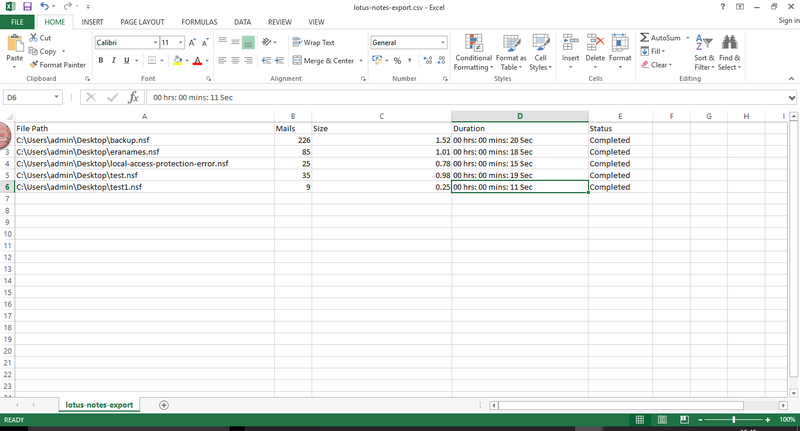 You will get the same files in the same structure after the migration process. i.e, you can easily import NSF to Apple Mail account without any data loss. Q. Can I import Lotus Notes NSF to Thunderbird in bulk? “I have been using IBM Lotus Notes for a long time. However, now I am thinking to convert NSF file to MBOX file format. The numbers of files are huge. Does this NSF to MBOX Converter can help me out in this situation?" Ans: Yes, our Lotus Notes to Thunderbird Migration Software is capable to export Lotus Notes mail to Thunderbird, as you want without any limitation. Note: NSF to MBOX COnverter Software will get delivered on your registered email id, within few minutes after placing the order. Incredible utility!! this is the first word comes to mind when I talk about Lotus Notes to MBOX Migrator. Indeed, this is an amazing product to convert NSF files to MBOX. I have never seen any application with so simple interface yet technically perfect. Thanks a lot. I was really in a dilemma when I thought to export lotus notes email to Apple Mail .mbox format. The main concern of mine is the security of the data. Fortunately, I found NSF to MBOX Converter at the right time. The best thing about the software is that it is compatible with all the versions of Windows. Therefore, I can say that it is a blessing for all the Windows users.